"The solar industry needs to know the UK government can be trusted If policy can be changed retrospectively, why should business believe that the UK is a safe place to invest? "This week, the government lost its appeal against a judge's ruling that its move to change the rates for solar feed-in tariffs before the official consultation has ended was "legally flawed". "The high court ruling is a real victory for the solar industry and for those households, businesses and community projects in my constituency who would have been left high and dry by the Department of Energy and Climate Change's attempts to apply a retrospective change to the rate. "There has always been widespread acceptance that the tariff would need to be reduced as installation costs fell and economic realities shifted. But the focus of the cross-party and public campaign against the government's plans has been the speed and scale of the proposed cut, which has already caused huge disruption to the solar industry and the 25,000-plus jobs it has created. "The courts have now twice ruled that these actions were unacceptable. Importantly, the courts have also sought to uphold a key principle about the very nature of government investment policy. "The central question is this: if policy can be changed retrospectively, why should business believe that the UK is a safe place to invest? Investors need to know whether a government commitment to support them can be trusted, or if retrospective changes can be made at any point after investments start." 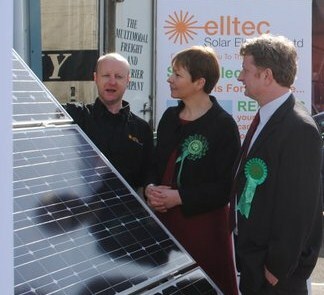 Read more about why the Leader of the Green Party, Caroline Lucas MP, thinks the coalition government has made such a hash of solar policy here on the Guardian website.